Confidential Couture stays true to its aim - making luxury accessible to the masses. The website is a heaven for those who would like to buy luxury brands at a lesser price and dont mind if its pre-owned. They offer pre-loved designer accessories at great prices, along with trusted Authenticity and Money back Guarantee. They also take special time and effort to curate a collection of items that will add value to our customer’s wardrobes. The team ensures that there are no fakes and the customer is never cheated. It has a large collection starting only from Michael Kors and recently added a Stunning Stella McCartney purse! They hold the Promise of Authenticity and its worth having atleast one luxury brand in your trousseau! You can also sell your gently used luxury designer goods and make space for newer ones! 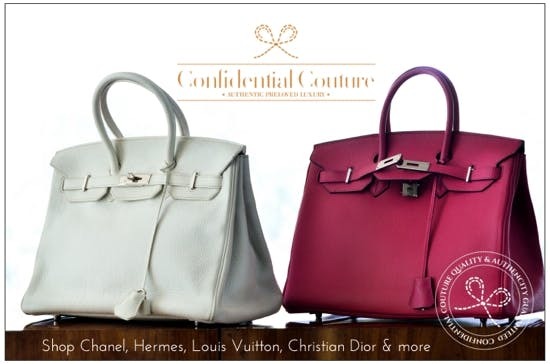 So check out Confidential Couture and add a dash of luxury to your trousseau! More giveaways and more sales and more slashed prices!! !